In honor of the release this weekend of the newest Pixar film “Brave,” I offer my review of “Up,” my favorite Pixar film and one of my favorite films period. This review originally appeared in the June 19th 2009 edition of the North Texas Conference United Methodist Reporter. In what has become a rite of summer, Pixar Studios released its latest masterpiece, “UP,” its tenth consecutive critically Iand commercially successful release. Since its inception and initial film “Toy Story,” Pixar has been the leading producer of children’s films. “UP” presents more evidence for the removal of the modifier “children’s” and recognition that Pixar produces the finest films of any production company. Like all of the Pixar films to date, this latest is a road film where the primary journey is one of self discovery. 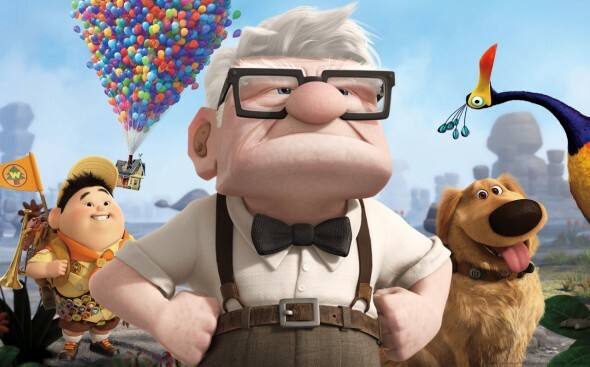 “UP” is the tender story of Carl Fredricksen, a lonely elderly man with a striking resemblance to Spencer Tracy, and Russell, an equally lonely yet innocently vulnerable adventure scout stowaway, who go on an adventure to fulfill a promise Carl makes to a loved one. Both Carl and Russell have experienced loss in life, and both characters are adventurers, though Carl’s sense of, and desire for, adventure has been missing since his recent life loss. As these kindred souls journey, they discover along the way that the most important adventures are the ones experienced closest to home and within one’s heart. As with all Pixar films “UP’s” characters are not the only ones who go on the journey. The viewers are every bit the stowaway as Russell, and learn, or are reminded, that paradise is not a faraway destination, but a local reality if we will but let ourselves be open to the possibility. As with 2008’s “Wall-e,” “UP” is a multilayered fi lm that extends into several genres. In addition to being the tenderest of coming, and going, of age stories, “UP” is also a comedy of the highest order with this year’s most laugh out loud moments, as well as a wonderfully executed action adventure movie. With the mode of travel being a floating house, by way of hundreds of helium balloons, as well as dogs whose thoughts are vocalized through an ingenious collar, and a large, colorful, and hereto undiscovered bird, “UP” is also a fantasy story that requires a degree of suspension of disbelief, and when surrendered, rewards the viewer with both entertainment as well as significant meaning. From the standpoint of faith, it was appropriate that “UP” opened on the weekend of Pentecost, as the film has a message that speaks to the Church, especially the United Methodist Church in light of the newly inaugurated “Rethink Church” campaign. One of the mottos throughout the film is “the Spirit of Adventure.” It is that spirit, within their hearts, that lifts Carl and Russell in their journey to discovery every bit as much as it is the helium within the balloons that lifts Carl’s house. Carl and Russell are open to the impossible possibilities that the ”Spirit of Adventure” affords, and because of this openness they discover what is truly important and are changed. Pentecost is the day the Church remembers and celebrates the Spirit of God enlightening the disciples and other followers of Christ as to the truth of the Gospel and indwelling in them the transformative power that molds them into the Body of Christ, the Church. “UP” offers two other lessons that apply to the Church and congregations. One is that dreams and adventures are not everlasting, they change as one grows and changes, and as old dreams or adventures die, new, viable ones can take their place if the old ones are released. If one holds on to dreams or continues ventures whose time has past, one’s time passes also. It is in the accepting and pursuit of new adventures and dreams that one stays vital. As Carl lets go of the old adventure and dream whose time had passed away and takes hold of the new one set before him, he becomes less infi rm, more active, and more the young Carl who had the desire and ability to dream and seek adventure. Through accepting the new challenge, his true identity as an adventure explorer is restored and renewed. Another related lesson is the drag baggage can have. At a crucial point in the film Carl needs to use the house to rescue Russell only to discover that the balloons have lost some of their helium and the house is too heavy to float. It is only by discarding the furniture in the house, furniture that had become the empty seats of memories and former happiness, that Carl is able to reach Russell, reignite his sense of adventure and mission, and experience life and happiness again. It is only when churches discard old furniture, the empty practices, traditions, or actual furniture or facilities, that are weighing it down, can it experience the new life and purpose God has planned for it in proclaiming the Gospel of Christ. This entry was posted in Faith Shots, Film Shots and tagged brave movie, church effectiveness, church renewal, church revival, faith and film, Pentecost, Pixar, road film, transformation, United Methodist Church, Up movie. Bookmark the permalink.